January 26, 1935: “The Garland Sisters” (Judy and her sisters) sang at Tommy Hicke’s thirteenth birthday party held at the Hicks home in North Hollywood, California. 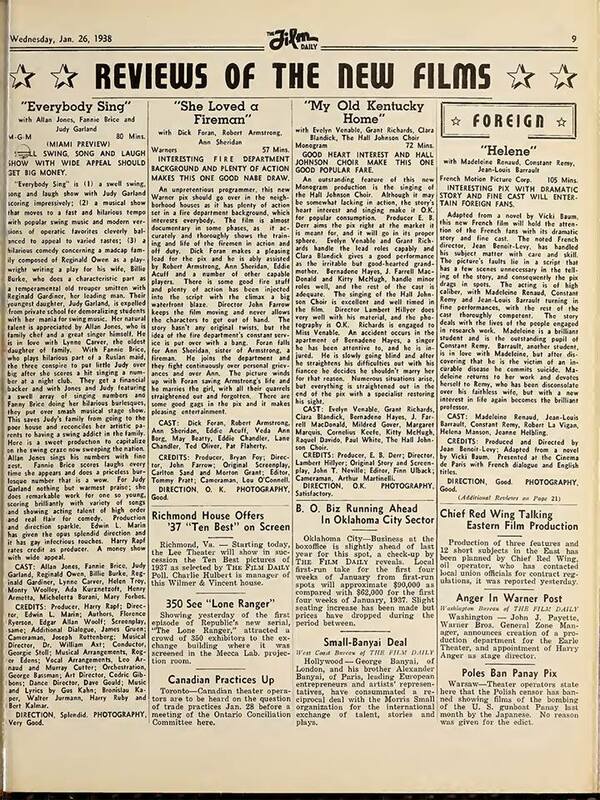 January 26, 1938: This review of Everybody Sing was printed in the “Film Daily” trade paper. “Everybody Sing” is (1) a swell swing, song and laugh show with Judy Garland scoring impressively; (2) a musical show that moves to a fast and hilarious tempo with popular swing music and modern versions of operatic favorites cleverly balanced to appeal to varied tastes; (3) a hilarious comedy concerning a madcap family composed of Reginald Owen as a playwright writing a play for his wife, Billie Burke, who does a characteristic part as a temperamental old trouper smitten with Reginald Gardiner, her leading man. 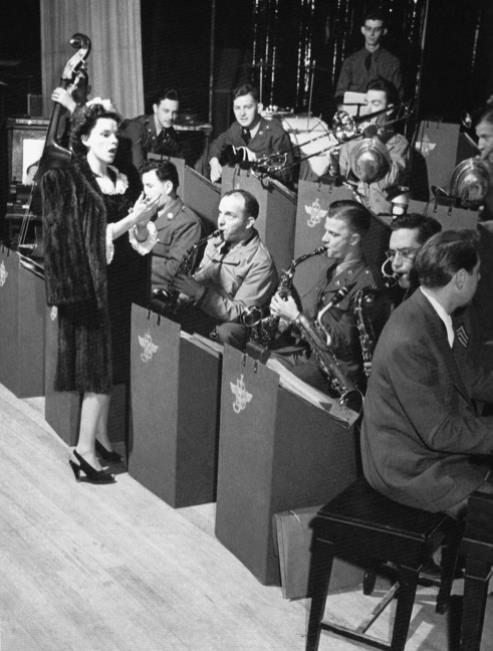 Their youngest daughter, Judy Garland, is expelled from private school for demoralizing students with her mania for swing music. Her natural talent is appreciated by Allan Jones, who is family chef and a great singer himself. He is in love with Lynne Carver, the oldest daughter of family. With Fannie [sic] Brice, who plays hilarious part of a Rusian [sic] maid, the three conspire to put little Judy over big after she scores a hit singing a number at a night club. They get a financial backer and with Jones and Judy featuring a swell array of singing numbers and Fanny Brice doing her hilarious burlesques, they put over a smash musical stage show. This saves Judy’s family from going to the poor house and reconciles her artistic parents to having a swing addict in the family. Here is a sweet production to capitalize on the swing craze now sweeping the nation. Allan Jones sings his numbers with fine zest. Fannie [sic] Brice scores laughs every time she appears and does a priceless burlesque number that is a wow. For Judy Garland nothing but warmest praise; she does remarkable work for one so young, scoring brilliantly with variety of songs and showing acting talent of high order and real flair for comedy. Production and direction sparkle. Edwin L. Marin has given the opus splendid direction and it has gay infectious touches. 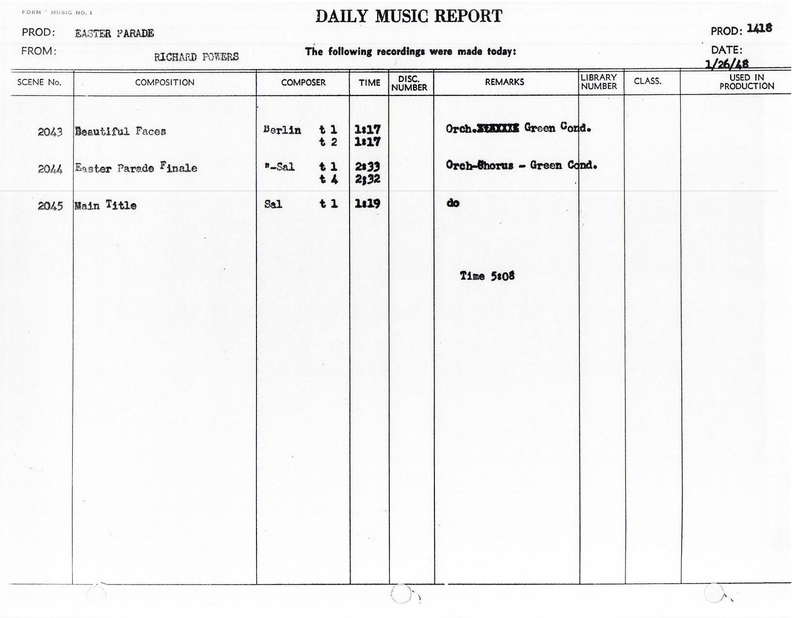 Harry Rapf rates credit as a producer. A money show with wide appeal. 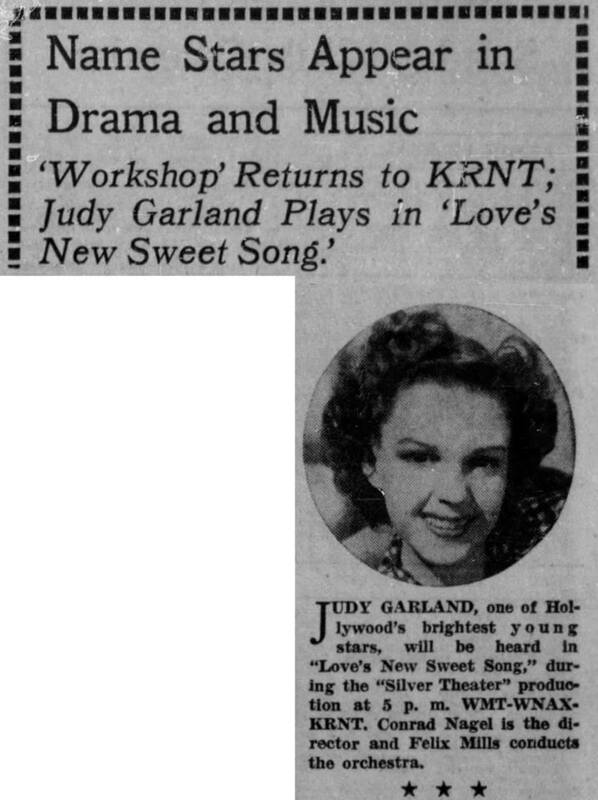 January 26, 1941: Judy performed her first semi-straight, dramatic role in the original radio play “Love’s New Sweet Song.” She wrote the story, which was based on her one number “Love’s New Sweet Song” and was a joint work of hers and her musical director (and soon to be her first husband), David Rose. The show aired on the CBS Radio “Silver Theater” show. 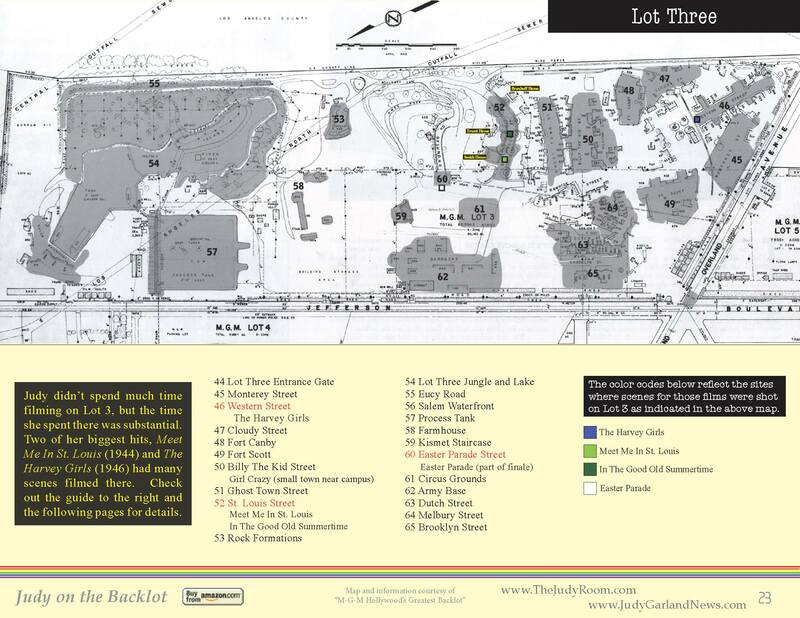 More Garland radio shows and other great music can be heard and downloaded at The Judy Room’s “Judy Sings! On The Radio” here. 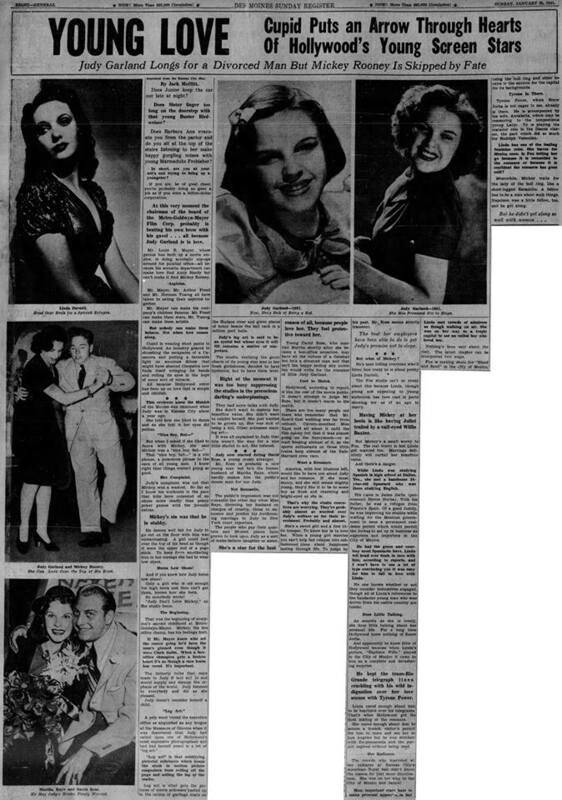 January 26, 1941: This oddly written article about Judy’s love life was published. Does Junior Keep the car out late at night? Does Sister linger too long on the doorstep with that young Buster Birdweiser? Does Barbara Ann evacuate you from the parlor and do you sit at the top of the stairs listening to her make happy gurgling noises with young Marmaduke Frosbisher? In short, are you at your wit’s end trying to bring up a youngster? If you are, be of good cheer, you’re probably doing as good a job as if you were a billion-dollar corporation. At this very moment, the chairman of the board of the Metro-Goldwyn-Mayer Film Corp. probably is beating his own brow with his gavel . . . all because Judy Garland is in love. Mr. Louis B. Mayer, whose genius has built up a movie empire, is doing acrobatic nip-ups around his palatial office – all because his scenario department can make love find Andy Hardy but can’t make it find Mickey Rooney. Mr. Mayer, Mr. Arthur Freed and Mr. Norman Taurog all have taken to eating their aspirins together. Mr. Mayer can make his company’s children famous, Mr. freed can make them stars, Mr. Taurog can make them artists. But nobody can make them behave. Not when love comes along. Cupid is wearing short pants in Hollywood. An industry geared to shushing the escapades of a Casanova and putting a favorable light on amorous didoes that might have shamed Cleopatra now finds itself wringing its hands and rolling its eyes in the hope of some sort of miracle. All because Hollywood never has been up on love that is simple and childish. This review knew the Munich of the Movies was imminent when Judy was in Kansas City about a year ago. She told how she liked to dance and as she told it her eyes did polkas. That “nice boy, but -“ is a file phrase, a poisonous phrase in the ears of all young men. I knew right then things weren’t going so good. Judy’s complaint was not that Mickey was a wastrel. So far as I know his workouts in the pace that kills have consisted of no abuse more deadly than penny poker games with juvenile extras. Mickey’s sin was that he is stubby. 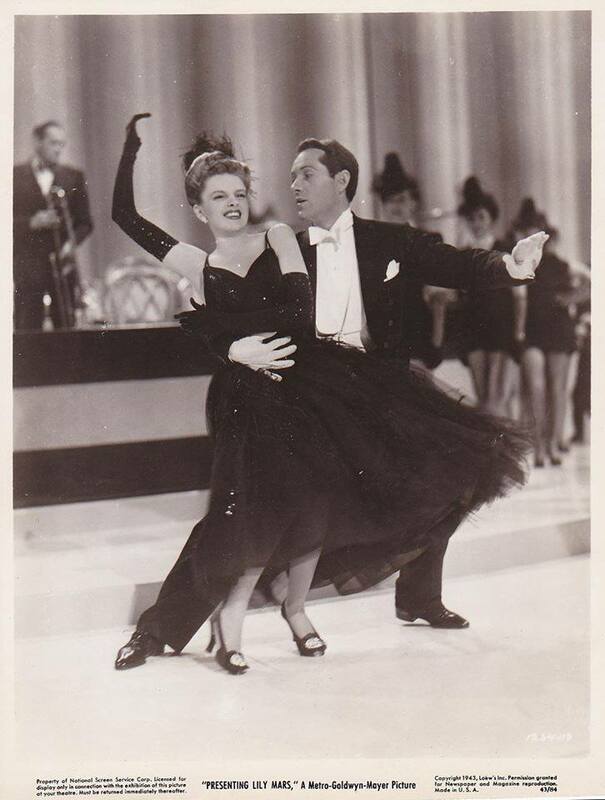 He dances well but for Judy to go out on the floor with him was embarrassing. A girl could look over the top of his head as though it were the upper end of a pogo stick. To keep from smothering him in her corsage she had to wear low shoes. And if you knew how Judy hates low shoes! Only a girl who is old enough for high heels and then can’t get them, knows how she feels. So somebody wrote: “Judy Don’t Love Mickey,” on the studio fence. That was the beginning of everyone’s second childhood at Metro-Goldwyn-Mayer. Mickey, the box office champ has his feeling hurt. If Mr. Mayer knew who set the rumor going he’d have the man’s gizzard even though it were Clark Gable. When a box-office champion gets a broken heart it’s a though a race horse has corns. It’s important. The fatherly talks that were made to Judy if laid end to end would supply and dismay the orphans of the world. Judy listened to everybody and did as she pleased. Judy doesn’t consider herself a child. “Leg art” is that solidifying pictorial substance which keeps the slush in motion picture magazines from rolling off the page and soiling the lap of the reader. Leg art is what gets the pictures of movie actresses pasted up in the cabins of garbage boats on the Hudson River and given places of honor beside the ball rack in a million pool halls. Judy’s leg art is said to be an eyeful but whose eyes it will fill remains a matter of conjecture. That studio, realizing the great charm of its young star was I in her fresh girlishness, decided to have hysterical, but to have them later. Right at the moment it was too busy suppressing the studies in the precocious darling’s underpinnings. It was all explained to Judy that this wasn’t the way for a nice little starlet to act. She listened. 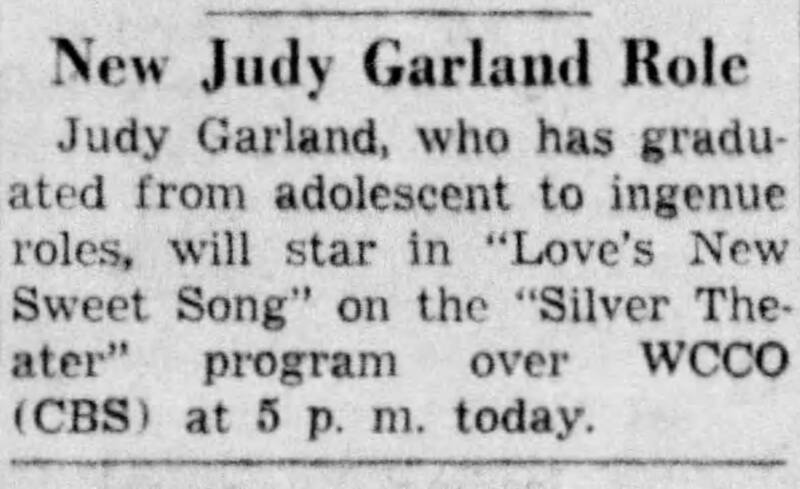 Judy now started dating David Rose, a young music arranger. Mr. Rose is probably a nice young man but he’s the former husband of Martha Raye, which hardly makes him the public’s dream man for our Judy. The public’s impression was not romantic the other day when Miss Raye, divorcing her husband on charges of cruelty, chose to announce and predict his forthcoming marriage to Judy to New York court reporters. The people who pay their quarts and 50-cent pieces have grown to look upon Judy as a sort of make-believe daughter or sister. She’s a star for the best reason of all, because people love her. They feel protective toward her. Young David Rose who married Martha shortly after she became a box-office sensation, may have all the virtues of a Galahad but he’s a divorced man and that isn’t the happy ending any movie fan would write for the romance of little Judy Garland. Hollywood, according to report, is like the rest of the movie public. It doesn’t attempt to judge Mr. Rose, but it doesn’t warm to the match. There are too many people out there who remember that Mr. Rose’s first wedding was far from reticent. 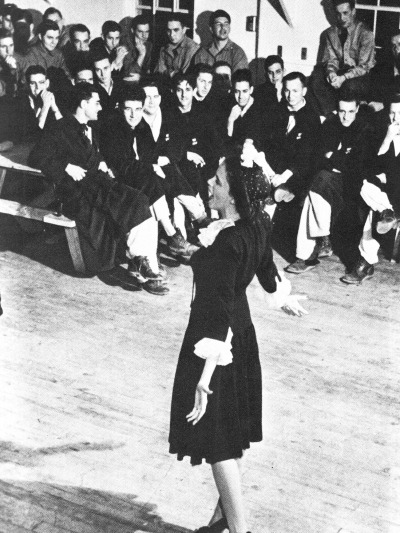 Caver-mouthed Miss Raye told all about it until the film colony felt that it was almost going on the honeymoon – or at least keeping abreast of it, as the sports enthusiasts on these little trains keep abreast of the Yale-Harvard crew race. America, with few illusions left, would like to have one about Judy and her romance. If she must marry, and she still seems mighty young, they’d like it to be some boy as fresh and charming and bright-eyed as she is. That’s why the studio executives are worrying. They’re probably almost as worried over Judy’s welfare as for their investment. Probably and almost. She’s a sweet girl and a fine little trouper. To know her is to love her. When a young girl marries you can’t help but relapse into old-fashioned ideas about happiness lasting through life. To judge by his past, Mr. Rose seems strictly transient. The best her employers have been able to do is get Judy’s promise not to elope. He’s been telling everyone who’ll listen how crazy he is about pretty Linda Darnell. The Fox studio isn’t so crazy about this because Linda, though young and appealing to young audiences, has been cast in parts showing her as of an age to marry. Having Mickey at her heels is like having Juliet trailed by a calf-eyed Willie Baxter. But Mickey’s a small worry to Fox. The real worry is lest Linda get married too. Marriage definitely will curtail her boxoffice value. While Linda was studying Spanish in high school at Dallas, Tex., she met a handsome 24-year-old Spaniard who was there studying English. His name is Jaime Jorba (pronounced Humie Horba). With this father, he was a refugee from Franco’s Spain. Of a good family, he was improving his studies while waiting for the Mexican government to issue a permanent residence permit which would permit the Jorbas to set up a business as exporters and importers in the City of Mexico. He had the grace and courtesy most Spaniards have. Linda fell head over heels in love with him, according to reports, and I won’t have to use a lot of type convincing you that it was easy for him to fall in love with Linda. No one knows whether or not they consider themselves engages, though all of Linda’s references to the handsome young man who was driven from his native country are tender. As sensible as she is lovely, she does little talking about her personal life. For a long time Hollywood knew nothing of Señor Jorba. And apparently he knew little of Hollywood because when Linda’s picture, “Daytime Wife,” played in the city of Mexico it came to him as a complete and devastating surprise. He kept the trans-Rio Grande telegraph lines crackling with his wild indignation over her love scenes with Tyrone Power. Linda cared enough about him to be heartsick over his telegrams. That’s when Hollywood got its first inkling of the romance. She cared enough about him to be heartsick over his telegrams. That’s when Hollywood got its first inkling of the romance. She cared enough about him to secure a 3-week visitor’s permit for him to come and see her in Los Angeles but he was stricken with flu-pneumonia and the permit expired without being used. The crowds who marveled at her radiance at Kansas City’s American Royal ball don’t know the reason for that inner illumination. She was on her way to the city of Mexico and Jaime! Most important stars hate to make personal appearances but Linda met crowds of admirers as though walking on air. She was on her way to a trope capital to see an exiled boy who loved her. Nothing’s been said about the visit. The latest chapter can be interpreted two ways. Fox is making shots for “Blood and Sand” in the city of Mexico, using the bull ring and other locales in the environ for the capital for the backgrounds. Tyrone Power, whom Señor Jorba is not eager to see, already is there. He is accompanied by his wife, Annabella, which may be reassuring to the tempestuous young Latin. Ty is playing the matador role in the Ibanez classic, the part which did so much for Rudolph Valentino. Linda has one of the leading feminine roles. She leaves for Mexico soon. Is Fox letting her go because it is reconciled to the romance or because it is confident the romance has gone cold? Meanwhile, Mickey waits for the lady of the bull ring, like a short-legged Escamilio. A fellow has to be a man about such things. Napoleon was a little fellow, too, and he got along. But he didn’t get along so well with women . 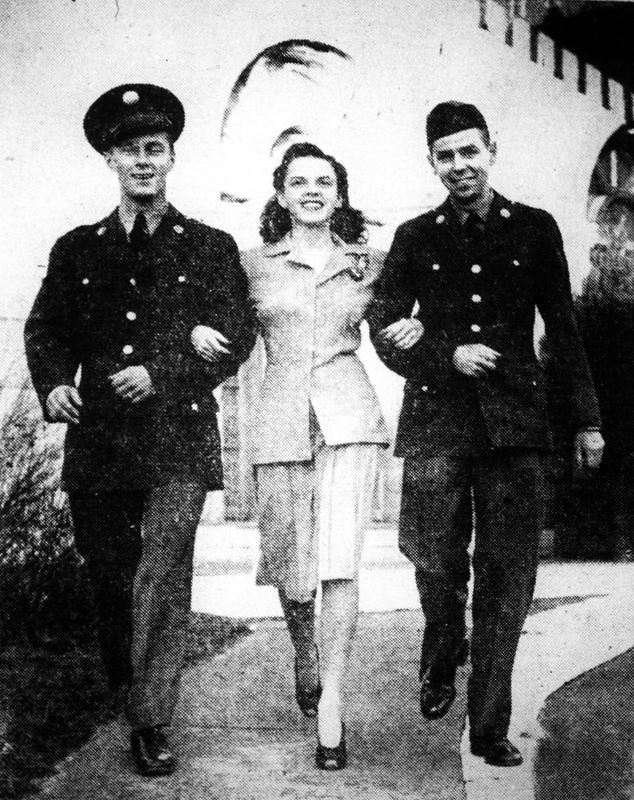 . .
January 26, 1942: Judy and husband David Rose performed at Fort Jefferson Barracks just outside of St. Louis, Missouri. This was the third stop on the couple’s USO tour of Army camps. 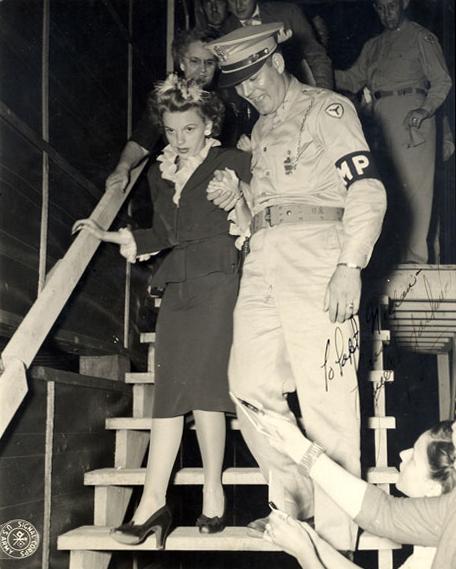 According to the papers, Judy had a tour of the camp at 2 p.m., then ate dinner at 5 p.m. with the troops in one of the mess halls. That evening she and David, along with the post’s own band, gave two shows, the first beginning around 7 p.m. 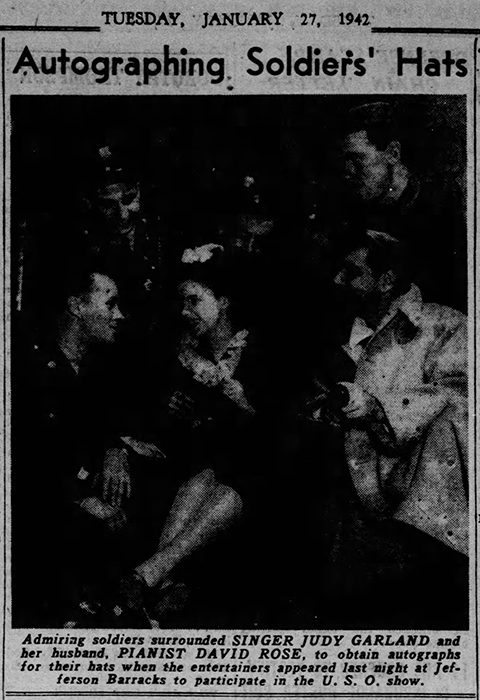 The photos above are from this day, including Judy’s tour and a clipping showing Judy autographing hats for the soldiers. That’s not in the best shape but it’s the only one I could find. 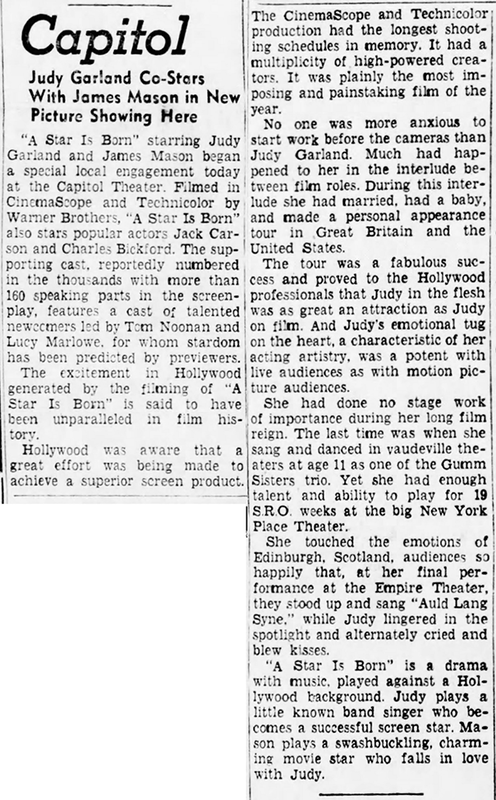 January 26, 1943: Judy was on her second of five days of rehearsals for the new Presenting Lily Mars finale. The film had finished principal photography in early November 1942 and Judy went right into work on her next film, Girl Crazy, with Mickey Rooney. It was decided that the original finale for Lily Mars wasn’t big enough finale for the film and to show Judy’s character of Lily Mars as a big star. 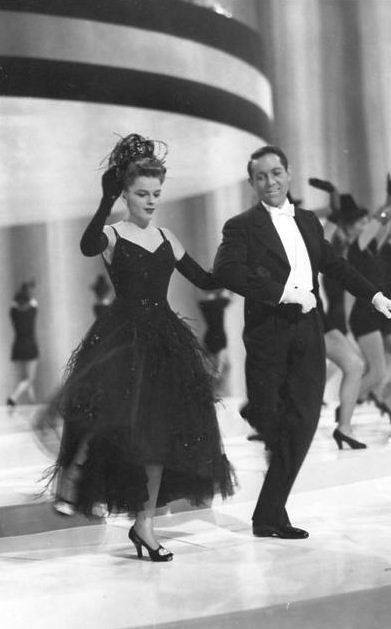 The new finale was a medley of songs leading up to the big finish of “Broadway Rhythm” featuring Judy, Tommy Dorsey and his Orchestra, and future director Charles Walters as her partner. The new finale was over 10 minutes long and was trimmed for the final cut of the film. The footage for the cut section, as well as for the original finale, “Paging Mr. Greenback,” do not exist, but the audio does and has been released on CD. January 26, 1944: Meet Me In St. Louis filming continued with scenes shot on the “Interior Conservatory” and “Interior Ballroom” sets. 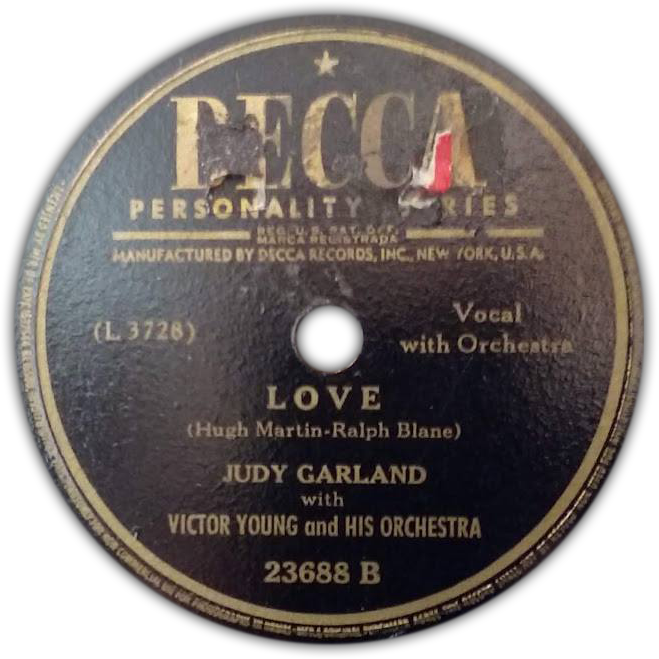 Time called: 10 a.m.; Judy was ready on the set at 10:47 a.m.; dismissed: 6:05 p.m.
January 26, 1945: From 8 p.m. to 11 p.m. Judy was at the Decca Records recording studio. She cut “This Heart Of Mine” and “Love,” both of which were released on March 22, 1945. 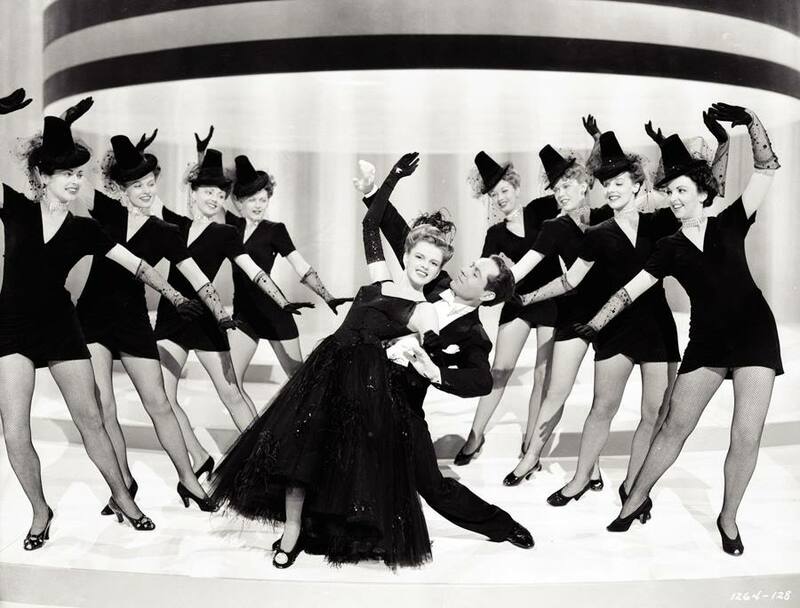 Judy was in the middle of filming The Harvey Girls at MGM, and earlier that morning she called in sick to the studio, per the assistant director’s notes: “Miss Garland called at 3:20 this morning to say that she was not feeling well and could not come to work today. We will try to shoot whatever we can without her.” Perhaps she was saving her energy for that Decca session later in the evening. 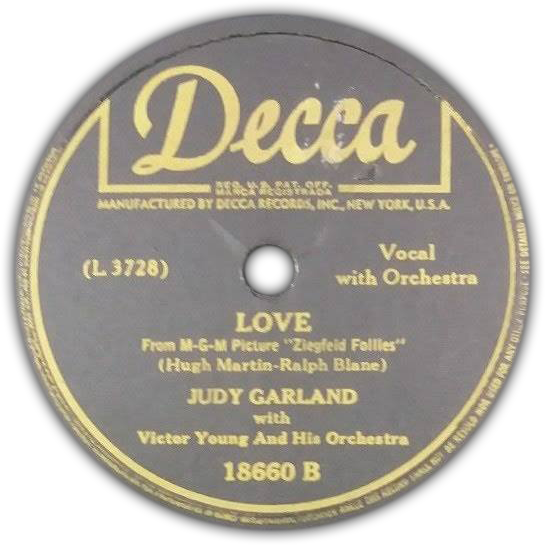 Check out The Judy Garland Online Discography Pages devoted to Judy’s Decca recordings here. Also, check out The Judy Room’s Filmography Pages on The Harvey Girls here. Photo Note: For the final shot of the title number that ends the film, MGM went to great lengths to re-create the famous Easter Parade from the early 1900s. The studio built a special set on the end of “Drumhead Road” on their Backlot #3 that was over 10 feet high and recreated the right section of the well-known vintage photo seen on the left in this photo combo with extras and vintage cars and horse-drawn buggies. 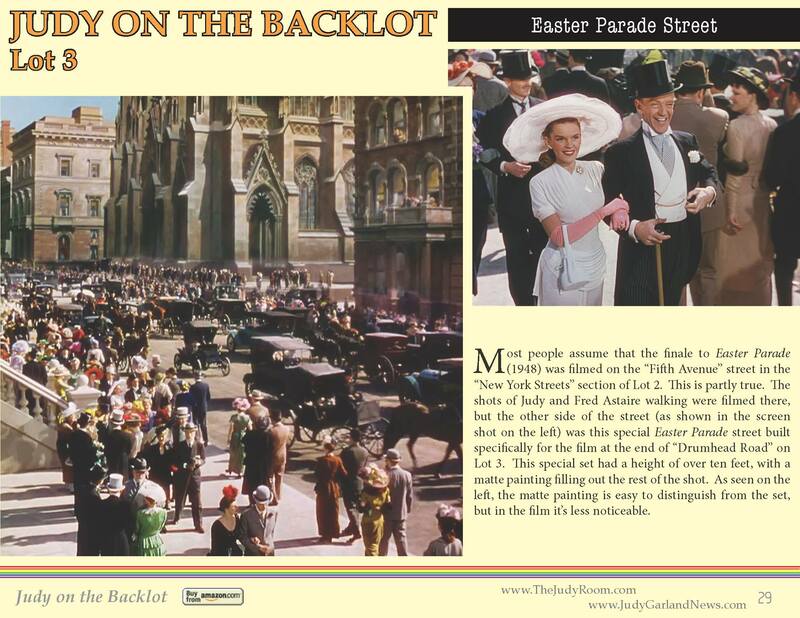 For the left side of the image, Judy and Fred were filmed on MGM’s Backlot #2 walking down “Fifth Avenue.” The rest was filled in with a matte painting (the middle image) created by MGM’s special effects wizard Warren Newcombe. The resulting effect in the final film is perfect. 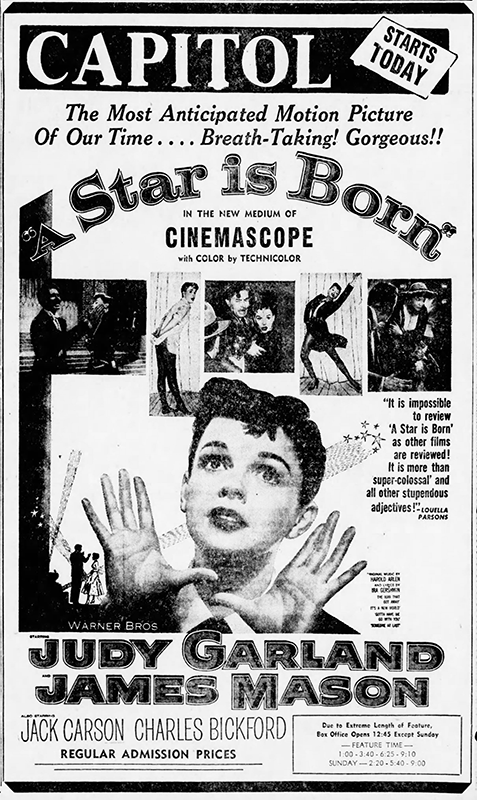 January 26, 1954: A Star Is Born ads and review. 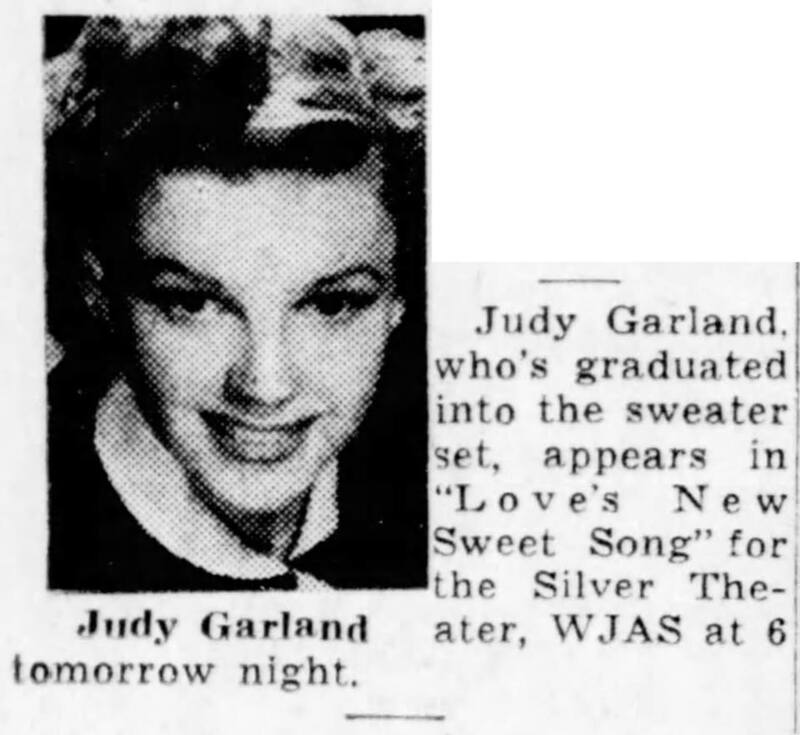 January 26, 1964: It was “Judy Night” on TV! Garland fans were treated to a double feature of “The Judy Garland Show” and The Wizard of Oz. 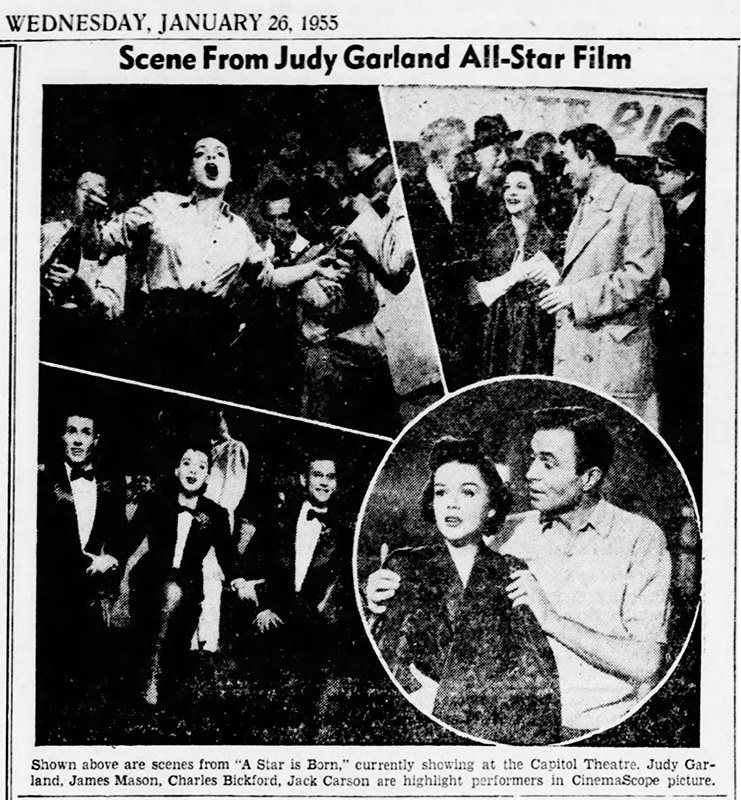 CBS-TV aired “Episode Eighteen” of “The Judy Garland Show.” The show was videotaped on January 14, 1964, at CBS Television City, Stage 43, Hollywood. It was the first show taped after the holiday break in production of the series that lasted from December 23, 1963, to January 11, 1964. 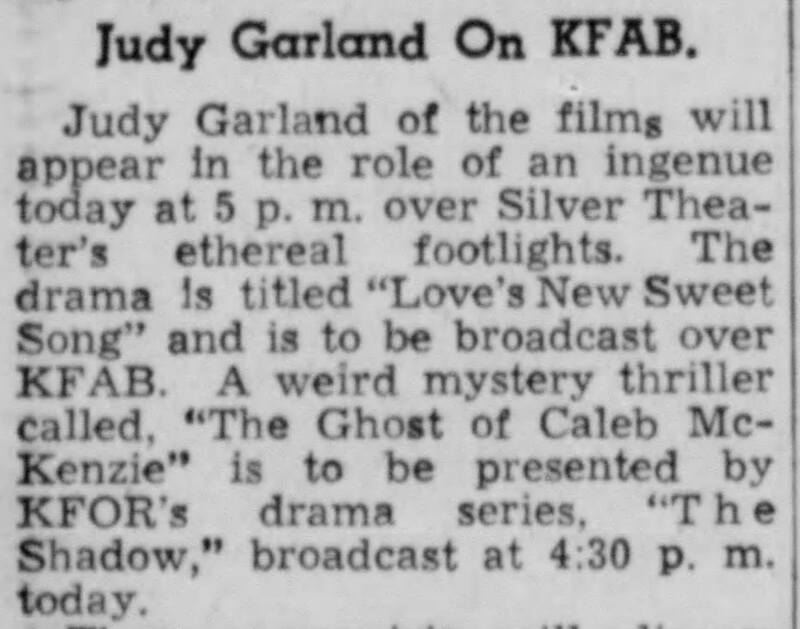 Also aired on this night was the annual showing of The Wizard Of Oz which was the only time it aired on the same night at Judy’s show. Needless to say, it was a great night for Garland fans! January 26, 1967: Judy and Tom Green attended a party, and then went to the midnight show at the Copacabana to see Jack E. Leonard and Lana Cantrell. Photo: Judy and Tom Green in 1967. Exact date unknown.